“According to the California Teratogen Information Service (CTIS) Pregnancy Health Information Line, there are many factors that can cause a man to be infertile and as around half of all infertility cases result from the man, it is important to properly study the causes. Donald W. Scott, the editor of The Journal of Degenerative Diseases and the co-founder of the Common Cause Medical Research Foundation, links vaccines to AIDS (as did Hillerman) and to US bioweapons research, and says they are contaminated with mycoplasma, a primitive bacteria that takes apart cell walls. “More parents are opting out of school shots for their kids. In eight states now, more than one in 20 public school kindergarten children aren’t getting all the vaccines required for attendance. The Associated Press analysis found more than half of states have seen at least a slight rise in the rate of exemptions over the past five years. States with the highest exemption rates are in the West and Upper Midwest. It’s ‘really gotten much worse,’ said Mary Selecky, secretary of health for Washington state, where six per cent of public school parents have opted out. Rules for exemptions vary by state and can include medical, religious or – in some states – philosophical reasons. Reasons for skipping some school shots vary. Some parents are sceptical that vaccines are essential. 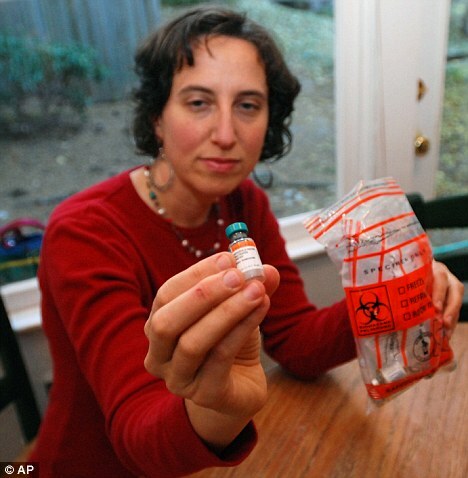 Others fear vaccines carry their own risks. Some find it easier to check a box opting out than the effort to get the shots and required paperwork schools demand. Still others are ambivalent, believing in older vaccines but questioning newer shots against, say, chickenpox. The number of shots is also giving some parents pause. By the time most children are six, they will have been stuck with a needle about two dozen times – with many of those shots given in infancy. The cumulative effect of all those shots has not been studied enough, some parents say. ‘Many of the vaccines are unnecessary and public health officials don’t honestly know what the effect of giving so many vaccines to such small children really are,’ said Jennifer Margulis, a mother of four and parenting book author in Ashland, Ore.
To be sure, childhood vaccination rates remain high overall, at 90 per cent or better for several vaccines, including those for polio, measles, hepatitis B and even chickenpox. In many states, exemptions are filed for fewer than one per cent of children entering school for the first time. Health officials have not identified an exemption threshold that would likely lead to outbreaks. But as they push for 100 per cent immunization, they worry when some states have exemption rates climbing over 5 per cent. The average state exemption rate has been estimated at less than half that. Even more troubling are pockets in some states where exemption rates much higher. In some rural counties in northeast Washington, for example, vaccination exemption rates in recent years have been above 20 per cent and even as high as 50 per cent. ‘Vaccine refusers tend to cluster,’ said Saad Omer, an Emory University epidemiologist who has done extensive research on the issue. 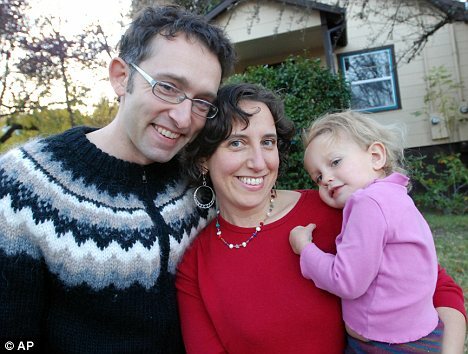 ‘Your child’s risk of getting disease depends on what your neighbours do,’ said Omer. And while it seems unlikely that diseases like polio and diphtheria could ever make a comeback to the U.S., immunisation expert Dr Lance Rodewald with the federal Centers for Disease Control and Prevention says it could happen. ‘Polio can come back. China was polio free for two decades, and just this year, they were infected from Pakistan, and there is a big outbreak of polio China now. The same could happen here,’ Rodewald said in an email. He cited outbreaks of Hib, a disease that can lead to meningitis, among the Amish who don’t consistently vaccinate their children. Russia had a huge diphtheria outbreak in the early to mid-1990s, he said, because vaccine coverage declined. ‘Measles is just visible, but it isn’t the only concern,’ Rodewald said. Alaska had the highest exemption rate in 2010-11, at nearly nine per cent. Colorado’s rate was seven per cent, Minnesota six-and-a-half per cent, Vermont and Washington six per cent, and Oregon, Michigan and Illinois were close behind. Mississippi was lowest, at essentially zero per cent. The AP found that vaccine exemptions rose in more than half of states, and ten had increases over the five years of about one-and-a-half percentage points or more, a range health officials say is troubling. Those states, too, were in the West and Midwest – Alaska, Kansas, Hawaii, Illinois, Michigan, Montana, Oregon, Vermont, Washington and Wisconsin. Arizona saw an increase that put that state in the same ballpark. Exemption seekers are often middle-class, college-educated white people, but there are often a mix of views and philosophies. Exemption hot spots like Sedona, Arizona, and rural northeast Washington have concentrations of both alternative medicine-preferring as well as government-fearing libertarians. 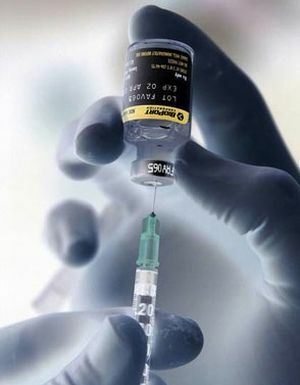 Opposition to vaccines ‘is putting people together that normally would not be together,’ observed Elizabeth Jacobs, a University of Arizona epidemiologist looking at that state’s rising exemption rates. What many of exemption-seeking parents share, however, is a mental calculation that the dangers to their children of vaccine-preventable diseases are less important than the possible harms from vaccine. Or they just don’t believe health officials, putting more stock in alternative sources – often discovered through Internet searches. ‘We are being told this by every government official, teacher, doctor that we need vaccines to keep us safe from these diseases. I simply don’t believe that to be true. I believe all the diseases in question were up to 90 percent in decline before mass vaccines ever were given. I don’t think vaccines are what saved the world from disease. I think effective sewer systems, nutrition, and handwashing (are the reasons),’ said Sabrina Paulick, of Ashland, Ore. She works part-time as a caregiver for elderly people in their homes and has a four-year-old daughter. Parents say they’d like to reserve the right to decide what vaccinations their children should get, and when. Health officials reply that vaccinations are recommended at an early age to protect children before they encounter a dangerous infection. ‘If you delay, you’re putting a child at risk,’ said Gerri Yett, a nurse who manages Alaska’s immunization program. Analysing vaccination exemptions is difficult. States collect data differently; some base their exemption rates on just a small sample of schools – Alaska, for example – while others rely on more comprehensive numbers. So the AP worked with researchers at CDC, which statistically adjusted some states’ 2010-11 data for a better comparison. ‘Every time we give them evidence (that vaccines are safe), they come back with a new hypothesis’ for why vaccines could be dangerous, said Kacey Ernst, another University of Arizona researcher. ‘I don’t understand how other people don’t see that these two things are related,’ said Stacy Allan, a Summit, N.J., mother who filed religious exemptions and stopped vaccinating her three children. ‘I wouldn’t be one to say I am absolutely certain these things are hurting our children,’ said Michele Pereira, an Ashland mother of two young girls. She is a registered nurse and married to an anaesthesiologist. While her daughters have had some vaccinations, they have not had the full recommended schedule. “A stunning Planned Parenthood document that includes radical ideas such as compulsory abortion and sterilization; special “permits” to have children; penalizing parents; and encouraging homosexuality dovetails with some Obamacare mandates, according to a former Planned Parenthood director. Abby Johnson, who left her position after helping with an abortion and writing about her experience in “unPLANNED,” said the document has been around for 40 years but has been virtually ignored. The document is a memorandum about population control to Population Council President Bernard Berelson from Frederick S. Jaffe, vice president of Planned Parenthood. She said she found out something during her current pregnancy that spurred her to try to bring attention to Jaffe’s work. She said she found out that not only did her insurance plan exclude maternity coverage, she could not find any private insurance companies offering such coverage. Their answers were not only alike but alarming, she said. This made Johnson question if Obamacare is part of the agenda to discourage pregnancy, an agenda that her former employer apparently tried to conceal for decades. Four years after the report was published in 1969, abortion was legalized in the U.S. Since then, some 54 million unborn children have been aborted, which averages about 3,000 babies being killed every day. Also, today there are more women than men in the American workforce. And from the year of the report through this year, the unwed birth rate has increased 300 percent, while the unmarried domestic partnership rate from that time through the turn of the century escalated almost six-fold. Since 1970, marriages have declined 30 percent, while divorce has increased by 40 percent. Homosexual indoctrination also is becoming prevalent in schools, and many times children are offered free contraception without their parents’ knowledge. Johnson is all too familiar with the so-called “progress” Planned Parenthood has made since its inception nearly a century ago and emphasizes how the abortion provider took in $1 billion in revenues last year alone. And Johnson warns against Planned Parenthood’s front as a family friendly “healthcare provider” that claims to look out for the welfare of the nation’s women and children. Johnson’s position on abortion took a drastic shift two years ago after seeing an ultrasound of a 13-week-old preborn baby struggling for life inside the mother’s womb before being killed. She witnessed the scene as a director at one of Planned Parenthood’s facilities in Texas and later turned pro-life. The abortion provider initially got a gag order on her to keep her from disclosing inside information about the questioned organization’s practices. But Johnson is not content to merely point out what Planned Parenthood and the government are doing. Widespread infanticide currently is taking place in communist China, where mothers are allowed to have only one child. In Russia, 73 percent of all pregnancies end up in abortion. Only vote for candidates who clearly state they will remove funding from Planned Parenthood.